WHEN: Saturday, March 18, 2017, at 7:30 p.m.
Purchase advance tickets online or print order form at arcadiaplayers.org. Group tickets (5+ people, $25 each) or individual tickets may also be purchased at 413-586-8742. Any tickets still available will be sold at the door for $40. 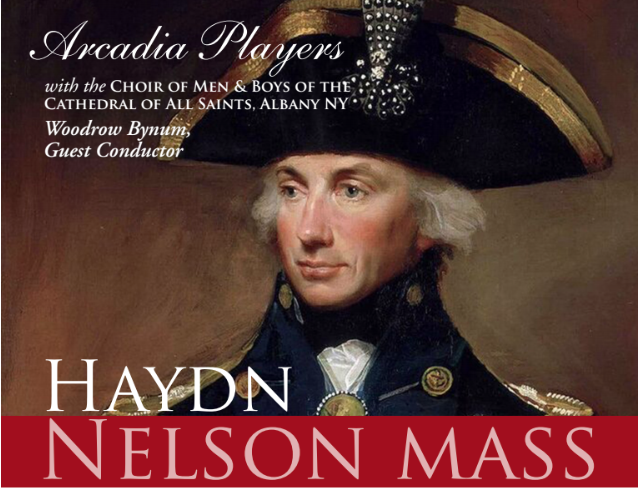 Arcadia Players and Men and Boys Choir from The Cathedral of All Saints, Albany, with guest conductor Woodrow Bynum, present the “Lord Nelson Mass,” or Missa in angustiis, by Franz Josef Haydn, on Saturday, March 18, at 7:30 p.m. The concert, concluding Arcadia Players’ 27th season, also features a motet by Haydn and two works by Mozart. The venue is Sweeney Concert Hall in Sage Hall, Smith College in Northampton. Sage Hall is at the end of Green Street, with parking in nearby campus lots and the Smith College Parking Garage. The All Saints Cathedral Choir, which joins Arcadia Players in the Lord Nelson Mass and the two motets, is the oldest continuously performing choir of its kind in the country. 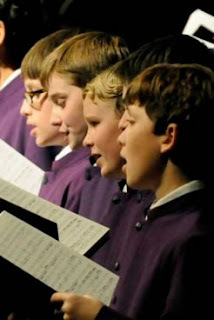 The members number 14 boys with treble voices and 12 men singing alto, tenor and bass. Besides taking part in weekly choral services during the academic terms, they appear regularly in concert. The ensemble has toured England on three occasions, performed with the Boston Symphony at Tanglewood and appeared with Arcadia Players in the memorable 2015 performance of Bach’s St. John Passion. Woodrow Bynum, guest conductor of this concert with Arcadia Players, has led the Cathedral Choir since 2007. Besides training the choristers and conducting their concerts and liturgical appearances, he performs widely as a baritone soloist in oratorio and symphonic works. He sings with Arcadia Players and the Handel and Haydn Society and has appeared with the Dallas Bach Society, Saint Thomas Church Fifth Avenue, and Albany Pro Musica. Joining Arcadia Players and the Cathedral Choir are soprano Sonja DuToit Tengblad, mezzo-soprano Katherine Growdon, tenor Eric Christopher Perry and baritone David Tinervia, Boston-based artists who have performed with the Handel and Haydn Society, Emmanuel Music, Boston Baroque, and many orchestras and opera companies farther afield. The major work on the program is Haydn’s Missa in Angustiis or “Mass in Adversity,” also known as the “Lord Nelson Mass.” It was first heard in 1798, as Haydn’s mass setting celebrating the birthday of Princess Marie Hermenegild, wife of the composer’s patron. The “adversities” of the title were widespread in those years, when Napoleon’s armies waged war throughout much of Europe and beyond. Haydn himself did not call the work the “Lord Nelson Mass,” but it was soon linked to the great admiral who had recently led the British fleet to victory over Napoleon in the Battle of the Nile. Haydn wrote this and other symphonic mass settings after returning to the Esterházy family from London. There he had heard choral works of Handel as well as performances of his own late symphonies. The Nelson Mass contains Handelian echoes as well as Haydn’s masterful symphonic writing, in turn dramatic, contrapuntal, serene and virtuosic. The composer’s primary biographer, H.C. Robbins Landon, considers the Missa in Angustiis “arguably Haydn’s greatest single composition.” It is the composer’s only mass setting in a minor key, and though there are periods of calm and moments of exultation, many passages are atypically dark. The scoring for strings and organ augmented by trumpets and tympani enhances the stormy quality of the work. The concert opens with Mozart’s beloved motet “Ave verum corpus” and Haydn’s motet “Insane et vanae curae,” a setting of a devotional text to music from his own oratorio Il ritorno di Tobia. Arcadia Players will also play the Mozart Divertimento in D major, K.136. The divertimento is the first of three such works, also called the “Salzburg Symphonies,” that Mozart wrote in the winter of 1772 as literal “diversions” from the work of writing his most ambitious opera to that time, Lucio Silla. Arcadia Players’ 2016-17 concert season is made possible through the support of our patrons and donors, our hosts Mount Holyoke and Smith Colleges, Wesley United Methodist Church, Hadley, and Grace Episcopal Church, Amherst, our media sponsor New England Public Radio, and in 2017 by the Cultural Councils of Amherst, South Hadley and Hadley, and the Northampton Arts Council, local agencies supported by the Massachusetts Cultural Council, a state agency. Arcadia Players is Ensemble-in-Residence at the Massachusetts Center for Interdisciplinary Renaissance Studies.